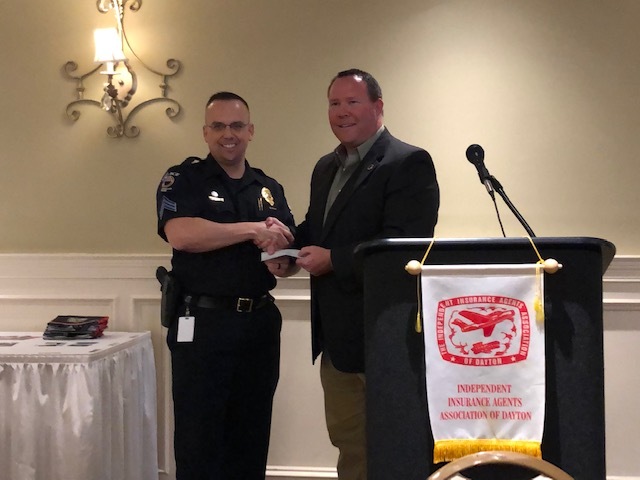 On Tuesday, April 9, the West Carrollton Police Department obtained a $1,100 grant from the Independent Insurance Agents Association of Dayton to purchase a Fatal Vision Alcohol program kit. The kit has tools that allow the department to simulate impairment at six different blood alcohol levels – depicting the potential danger during misuse of alcohol. The department plans to use the kits during community outreach initiatives such as National Night Out, Citizen’s Police Academy and the Police Explorer Program. “The requirements of the grant were that the money had to be used for something that impacted your community in a positive way,” said Police Chief Doug Woodard. “We appreciate the organization for providing the resources that will fund this program,” Woodard said. For more information about the kit or to request a demonstration, call Sgt. Nate Biggs at (937) 847-4672. Photo: From left, West Carrollton Police Sgt. Nate Biggs and Rob Stephens, Independent Insurance Agents Association of Dayton executive committee member.